6 Decades is featured in today's New York Times. Randy Kennedy's article takes a tour of NYC's art-focused bookstores, with nine stops along the way, including Printed Matter, Dashwood, Harpers' Books, and a "scrappy newcomer" by the name of 6 Decades. Hey Randy, Thanks! Glad you like our moxie. Pick up a copy of the August 17th issue and turn to page C20, or read it online here: Drop In, and By Appointment. And be sure to click on the slideshow that accompanies the article: Galleries of the Page. We are also releasing our August email list of books and ephemera today. 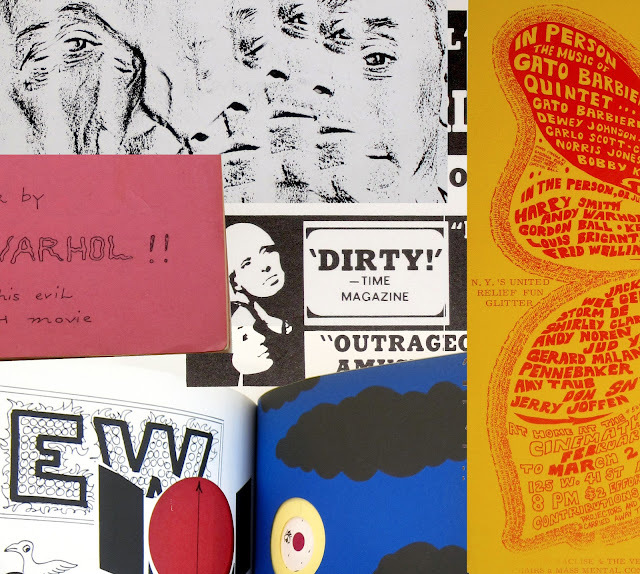 There are flyers from the 1980s East Village art scene, a scarce New York Dada periodical, two Bruno Munari books, and a notorious Ed Sanders/Andy Warhol publication with a title that's not-fit-to-print (at least not in the Times, that is).